Report to CEO. 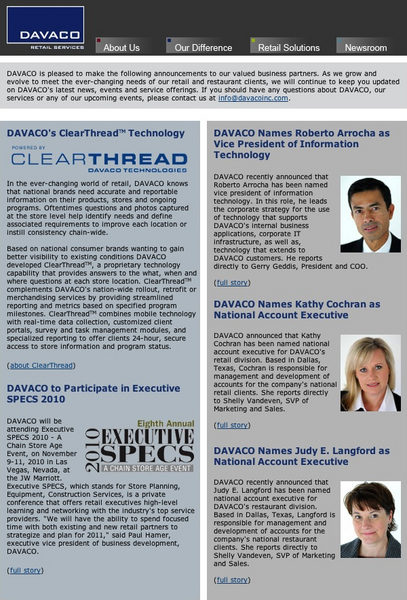 Head of ClearThread Division. Leads the corporate technology strategy supporting a national retail, restaurant and hospitality services company. Responsible for defining the technology blueprint for the enterprise and driving business innovation leveraging technology (SaaS, mobile, IoT). Leads company-wide initiatives and oversees a number of teams including Information Technology, Software Development, Quality Assurance and Support. Led Enterprise Architecture function at American Airlines(AA). Responsible for establishing enterprise and mobile application architecture standards and policies. Member of the enterprise Service Oriented Architecture (SOA) Council. Masergy is a global network service provider with $120MM in revenue and a 70% annualized growth rate offering QoS-based, customer-controlled embedded WAN services over a native IP/MPLS network specializing in real-time application performance across converged enterprise networks. Report to CIO. Director responsible for defining the IT blueprint for the enterprise. Established the vision and long-term strategy for enterprise-wide systems development and support from commercial software to business and operations support systems (BSS/OSS) supporting a global IP/MPLS network. Led a geographically distributed (DC, Boston, London and Plano) software engineering organization responsible for all phases of the SDLC and ongoing support for high-performance, high-availability custom commercial applications and BSS/OSS in an environment of diverse deployment platforms and computing environments. Provided dotted-line leadership for IT Operations and Infrastructure. Results-driven, high-energy, customer focused, technology executive with track record of creating business value, promoting transformation, profitability and agility in high growth organizations. Successful at building and leading technically sophisticated service and product development organizations, from start-up through maturity. Passionate leader with demonstrated ability to inspire management teams to expand their vision of the possible. Change agent with superior strategic planning and execution skills and a history of leveraging emerging technologies as a key enabler of transformation. Multi-lingual. Fortune 100 and startup experience.